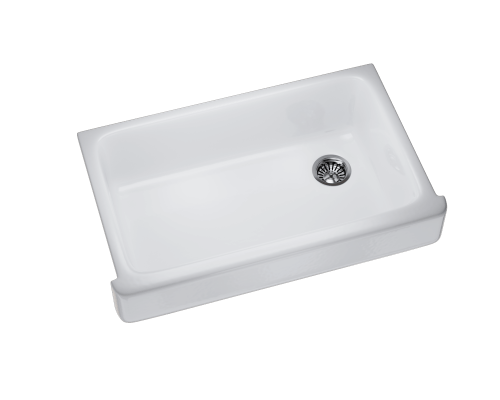 Should I Get A Cast Iron Or Fireclay Farmhouse Sink? 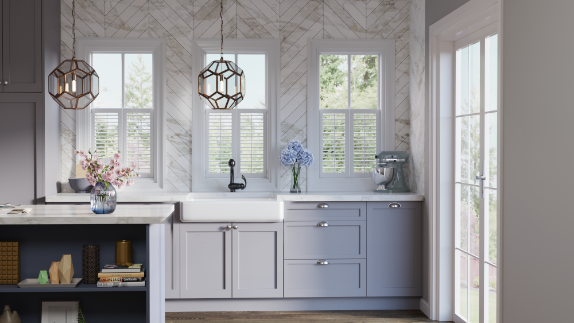 If you’re looking to buy an apron or farmhouse style sink, you might be wondering what your options are. What will be the longest lasting, the best deal, and the easiest to maintain? The two top contenders are either a enamel-coated cast iron or a fireclay apron sink. Both are very strong materials, and both have been used for hundreds of years to make not only sinks but also structural building materials and tools for extreme temperatures. 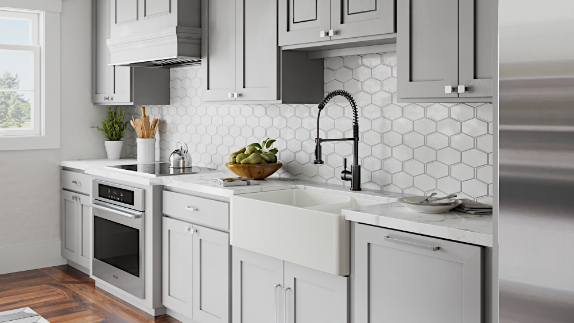 So when it comes to a fireclay vs cast iron sink, which one is best for your kitchen? Being that it is iron melted down and cast into a mold, cast iron is incredibly strong and durable. The enamel’s smooth surface is resistant to staining and easy to clean. It comes available in a variety of colors, so if you are looking for something a little more unique in your farmhouse sink, cast iron might be the right choice. It tends to be more affordable than fireclay, though it is also heavier and may require some additional undermounted support. Because it is coated in enamel, chips and scratches will be more obvious when they are deep enough to show the iron underneath. Avoid using abrasive cleaners on a cast iron sink to keep the surface shining. 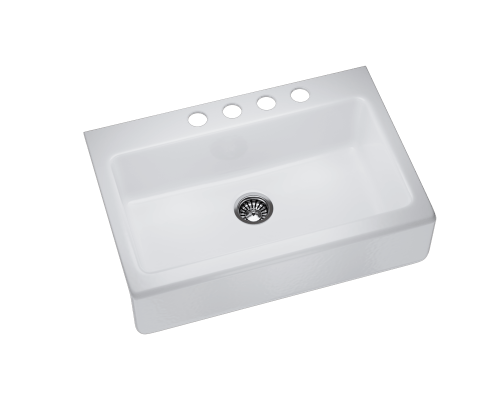 You might be wondering, what is a fireclay sink made of? 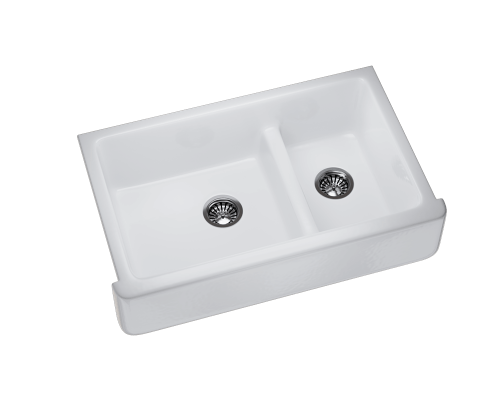 Fireclay is a clay and enamel composite that has been molded and then fired at extremely hot temperatures, making fireclay sink durability almost indestructible. 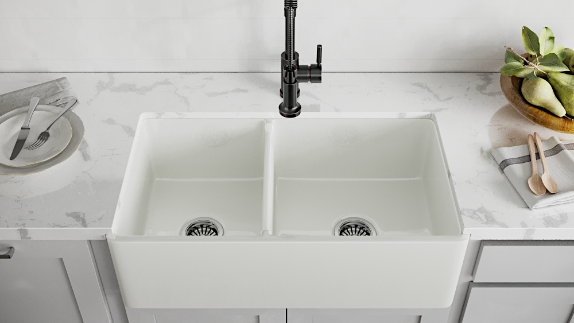 A fireclay farmhouse sink is much harder to scratch or chip than the porcelain coating on a cast iron sink, and of course will not rust as exposed iron tends to do. Fireclay tends to come only in shades of white, and is more expensive, but its light weight and strength make it a very practical choice. 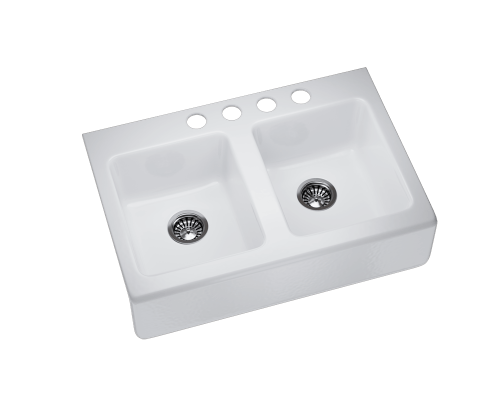 Fireclay sinks are usually reversible, with a smooth surface on one side and a fluted design on the other. Either way you go, a farmhouse sink is a huge convenience in the modern kitchen, as well as a beautiful statement piece. Their strength and charm have stood the test of time, having gone from being a key piece of rural living, to a luxury item in large expensive kitchens, to now being a sought after amenity in many modern homes. 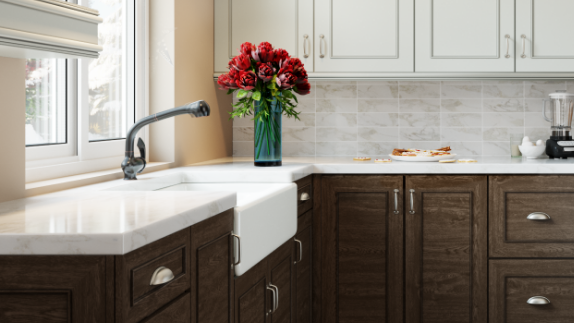 Adding a farmhouse sink to your kitchen will increase property value and practically pay for itself, no matter which material you choose. Shop Should I Get A Cast Iron Or Fireclay Farmhouse Sink?